WEST LAFAYETTE, Ind. — Facebook for scientists — but built to facilitate serious research rather than socializing — and an award-winning method for putting idle computers to work on scientific breakthroughs are Purdue-developed technologies in the spotlight at the SC09, the world’s largest high-performance computing conference. Purdue is highlighting the HUBzero and DiaGrid technologies at the university’s booth at SC09, which opens today (Monday, Nov. 16) in Portland, Ore.
HUBzero is a soon-to-be open source software platform developed by Purdue for deploying and applying computational research tools, visualizing and analyzing results interactively and publishing them, all through a familiar Web browser. Built-in social networking features akin to Facebook create communities of researchers and educators in science, engineering, medicine and almost any field or subject matter. DiaGrid works by pooling computers over the Purdue campus network and off campus via the Internet and fast research networks. Whenever machines in the pool are idle, such as at night or when their owners are at lunch, the system sends work to them. Campus Technology Magazine selected DiaGrid for a 2009 international Campus Technology Innovators Award. Purdue has created an automated system to link the computers of SC09 participants to the pool during the conference. The Purdue booth includes a scoreboard to keep track of whose machines are running the most jobs. The booth is designed to promote Purdue; Information Technology at Purdue (ITaP), the university’s central information technology organization; and the Rosen Center for Advanced Computing, ITaP’s research and discovery arm. ITaP technologists developed HUBzero and DiaGrid. Purdue’s booth also will provide academic information to potential Purdue students and information to job seekers about positions with Purdue, ITaP and the Rosen Center. Nearly 10,000 people attended the conference in 2008. Purdue has become a recognized leader in cyberinfrastructure with the development of HUBzero, which powers nanoHUB.org and many other Web-based “hubs” for research collaboration, says Michael McLennan, senior research scientist and hub technology architect at Purdue. NanoHUB is an international resource for nanotechnology theory, simulation and education with tens of thousands of users. Other hubs link researchers transforming laboratory discoveries into new medical treatments, and Purdue is now working in a consortium with Indiana and Clemson universities and the University of Wisconsin to advance the technology even further. A hub will be at the center of the Network for Earthquake Engineering Simulation (NEES), a $105 Million National Science Foundation program announced in September, which is led by Purdue. Purdue electrical and computer engineering Professor Rudolf Eigenmann, co-principal investigator of NEES, will give a workshop titled “Cyberinfrastructure for Earthquake Engineering” at the Purdue booth. McLennan will host two workshops on HUBzero and one about nanoHUB during the conference. Purdue scientist Mathieu Luisier will offer a workshop on using massive supercomputers to simulate nanoscale electronic devices for the next generation of electronics, a central focus of nanoHUB. DiaGrid includes computers in student computer labs, offices, server rooms and supercomputing clusters and is the first multi-campus collaboration of its kind. Purdue’s partners in DiaGrid are IU, Indiana State University, the universities of Notre Dame, Louisville and Wisconsin, Purdue’s Calumet and North Central campuses, and Indiana University-Purdue University Fort Wayne. 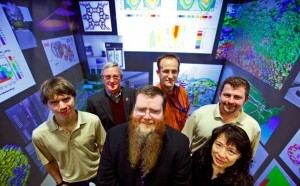 Together, they now make nearly 30,000 processors available for research jobs ranging from understanding the Solar System’s formation to imaging the structure of viruses at near-atomic resolutions in an effort to develop new ways of battling viral illnesses, from swine flu and the common cold to West Nile virus and AIDS. “The sheer size and ingenuity of the initiative, as well as the diversity of computing resources represented in the grid, really set the project apart,” Geoffrey Fletcher, editorial director of Campus Technology, said in announcing the Campus Technology Innovators Award for DiaGrid.